Artists, curator Raghavendra Rao K.V., and members of the South Asian Canadian Histories Association shared their work and the artistic intervention in the story of Canada at 150+. 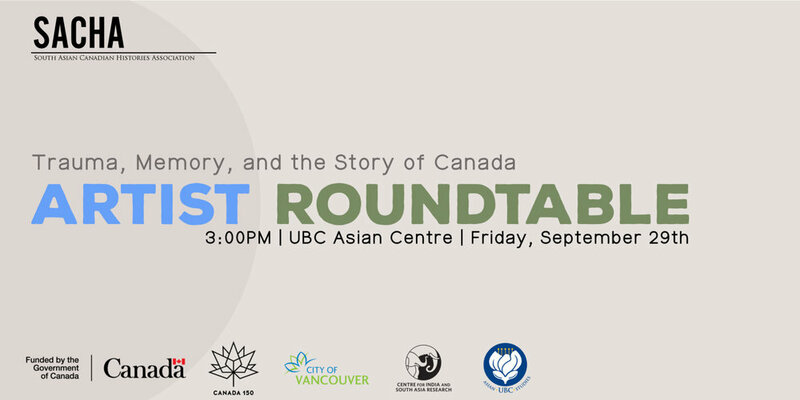 This conversation was moderated by Dr. Anne Murphy, Associate Professor, Department of Asian Studies at UBC. Sameer Farooq’s and Umesh Maddanahalli’s work for the exhibition, were on view. Punjabi Market & All India Sweets and Restaurant, 6560 Main Street, Vancouver. Public joined the artists and members of the South Asian Canadian Histories Association for a public art display, performances, and art walk that explored the “Canada at 150+: Trauma, Memory and the Story of Canada” works in the Punjabi Market. The exhibition at the Punjabi Market featured works by three prominent Canadian artists – Vikky Alexander, Sonny Assu, and Hyung-Min Yoon – from across the country. All India Sweets & Restaurant, 6560 Main Street, Vancouver. Walking Tour Guides: Naveen Girn, Paneet Singh and Milan Singh. "At the Intersections" was a series of walking tours in the Punjabi Market as a part of the programming for the "Canada at 150+: Trauma, Memory, and the Story of Canada" art exhibition. Walking tour guides Naveen Girn, Paneet Singh, and Milan Singh shared stories of politics, protests and processions and linked the history of the Market to the larger history of the South Asian community in Vancouver. In the first tour, attendees also had an opportunity to engage with artists whose work was featured in the exhibition and curator Raghu Rao K. V. In total, there were over 60 participants. Bangalore-based conceptual and performance artist Umesh M.S. engageg with the Canada 150+ theme in a short performance followed by a conversation with the performer, artist Jason Baerg, and exhibition curator, Raghavendra Rao K.V. Jason Baerg’s digital artwork was on view in the atrium of SFU Woodward’s, inviting guests to join for an evening of art and conversation.